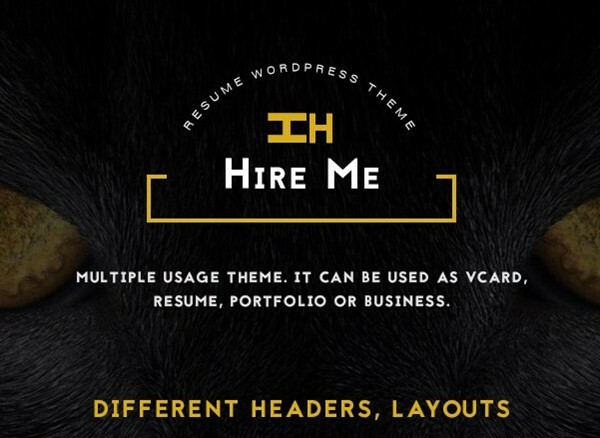 Hire Me WordPress Theme is multiple usage theme. It can be used as vCard, Resume, Portfolio or Business. Theme feature is modern design with scrolling pages. It is made SEO friendly for all browsers. It works perfect in all browsers. Design of this theme is modern, clean and very friendly for checking website. Your visitors will love it. Also in download package are included PSD files. So you can change everything in PSD and later on in Theme Options. You can build page content on a really easy way. With Visual Composer. But what is this? With this added feature you can build your content with clicks. No coding, just clicks. But if you want to write posts on a old way you can also use default wordpress editor.